But beneath the rubble of media coverage lies the real suffering of millions. So what the heck can we do about it? Kick in some cash to a trusted organization, for a start. 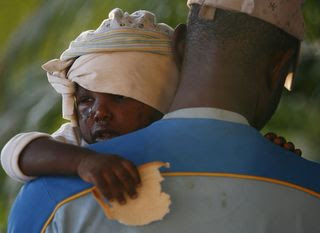 Save the Children is bringing relief--food, clean water, medical aid--to this devastated region. But they need our help to keep doing it. And it couldn't be easier. To donate $10--that's two venti lattes--to Save the Children's efforts, just text "SAVE" to 20222. That's it. You're done. To read first hand accounts of Save the Children's relief work in Haiti and to see what your dollars can do, check out their blog, Voices from the Field. So, you think mid-January is the wrong time to turn your thoughts toward gardening? Yep, me too. Until my talented and horticulturally advanced friend Amy taught me a thing or two, that is. Were you aware that good gardening requires planning and that there are online tools to help you map out your growing space? Luckily for all of us, Amy has finally decided to spread her knowledge around like so much compost; she's writing her own blog now, called Amy's Harvest. It's worth a peek if gardening is your thing--or if you're trying to make it your thing. And look for Amy to be guest blogging here soon with tips on gardening with Little Ones.